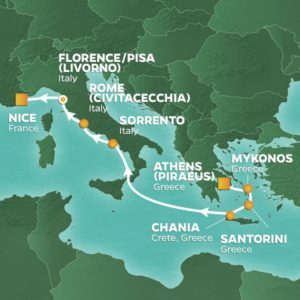 Join Chives Restaurant for ten nights as we sail from Greece to Italy on a classic voyage with late stays or overnights in almost every port. 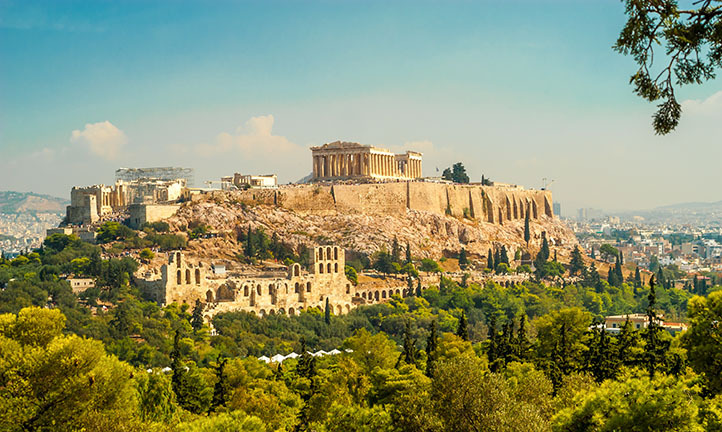 You’ll enjoy one night in Athens, before boarding the beautiful Azamara Pursuit. You’ll then sail on to Mykonos, and the iconic Grecian views of white-washed houses, blue-domed buildings, and spinning windmills. Head to Little Venice for seaside splendor, then get a taste of the island’s legendary nightlife before you pull out of port. 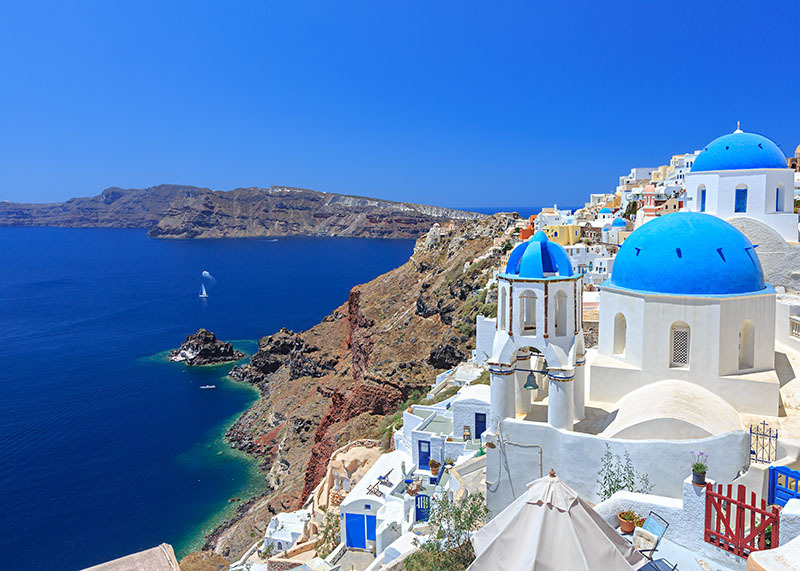 Your stop in Santorini promises to be stunning. Take a cable car up to the capital of Fira and settle into a taverna for an unforgettable sunset over the Aegean. It’s time to island-hop over to Crete for the next destination. Chania is a mosaic of ancient civilizations, from Minoan, to Byzantine, to Venetian. 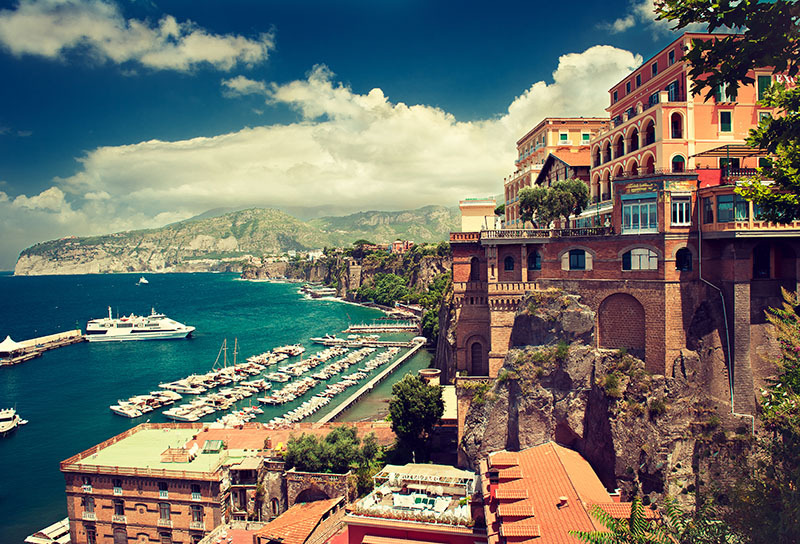 After a day at sea, you arrive in Sorrento—a wonderfully walkable city and the gateway to the Isle of Capri. Next, Rome holds endless opportunities for adventure—even if you’ve already been. 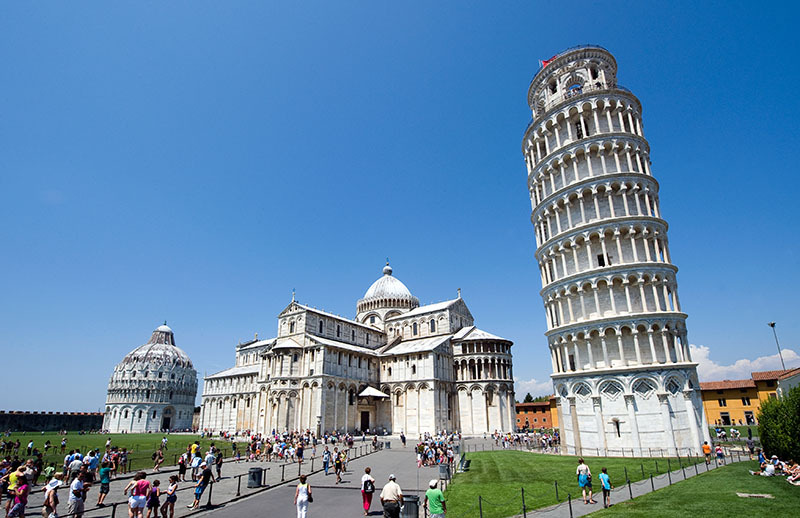 Next stop Livorno, where an overnight stay allows you to experience the opulence of Florence and picture-perfect Pisa. 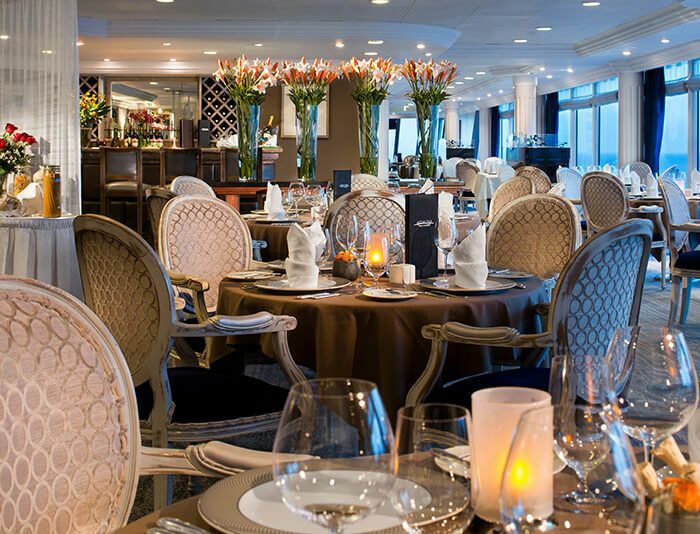 Conclude your voyage in Nice for a little dash of joie de vivre. Motorcoach transportation is included from various pickup points to Chicago O’Hare airport for your overnight flight to Athens. Arrive at Athens Airport where you’ll be transferred to your hotel for the evening. 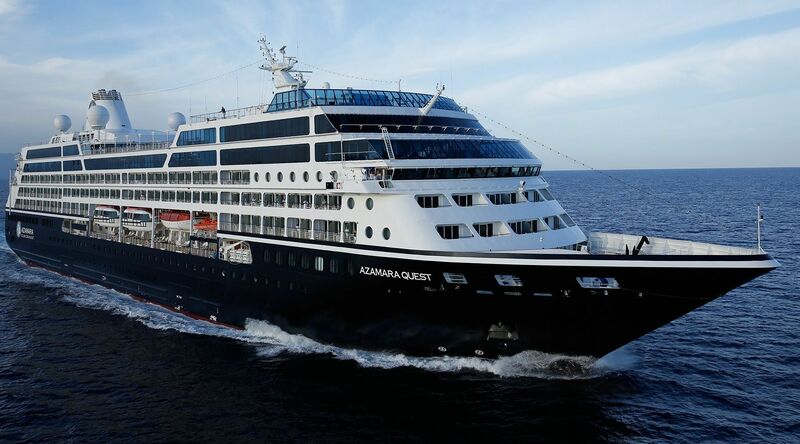 Enjoy breakfast and a leisurely morning before your transfer to the Azamara Pursuit. Start your journey in Piraeus with an archaeological walk past landmarks like the Temple of Olympian Zeus, Ancient Agora, and of course, the Acropolis. Afterwards, head to the Central Market for a feast of fresh fruit and veggies, nuts, olives, and Grecian cheese. Picture perfect is the best way to describe Mykonos. 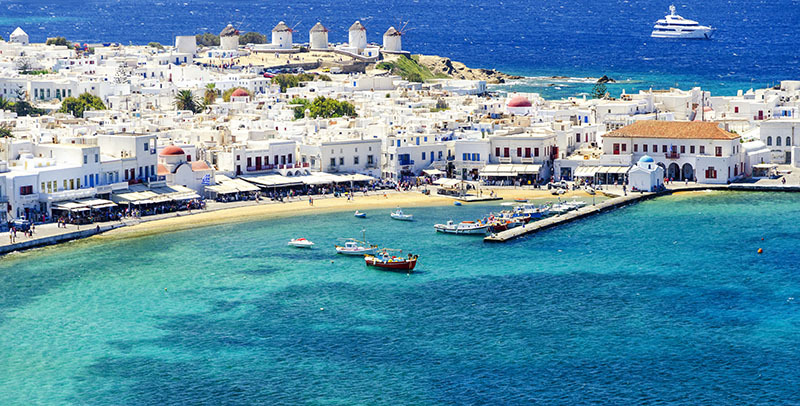 Idyllic in every way, from the brilliant blue water in its harbor to the rows of 16th-century Venetian windmills, Mykonos is a postcard come to life! 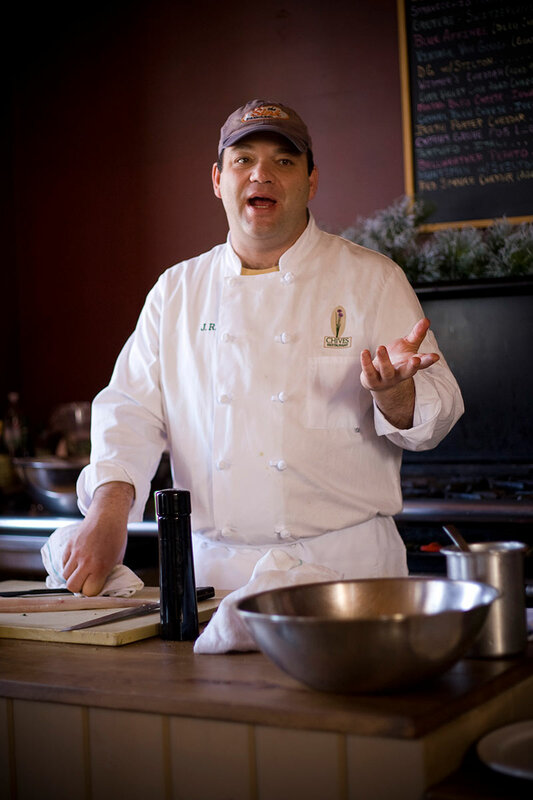 Spend your days strolling delightful cobblestone streets and visiting artisan craft shops. And when the sun goes down, discover why locals refer to this hedonistic city as the Ibiza of Greece! The capital, Fira, clings to the rim of the caldera 900 feet above the sea. Take the cable car, or giddy-up on a donkey to climb the 588 steps to the top. Next, hike to nearby Oia, a quintessential Greek village. Later, head south to the 3,500-year-old Minoan town Akrotiri. Often called Greece’s answer to Pompeii, the well-preserved ruins provide a glimpse into Santorini’s storied (and explosive) past. 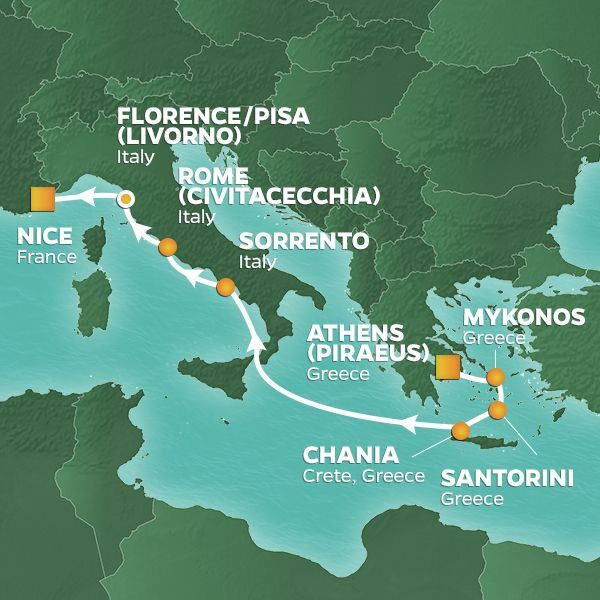 Venetian splendor gives Crete's second largest city, Chania, a distinctly Italian air. Greek and Ottoman influences add to the city's unique history and culture—each era certainly worth exploring. Framed by a dramatic mountain backdrop, Chania is an exceptional destination for history buffs, with plenty of tavernas and cafés to recharge after a day of discovery. Looking out from Sorrento is the Isle of Capri. The island is divided into two main parts, Capri and Anacapri. Capri is full of Italian luxury, with designer stores and five-star hotels lining the streets, while Anacapri is slightly more down-to-earth. Take a relaxing chair-lift ride to the very top of the island, as the views are jaw-droppingly gorgeous. Always enchanting, the Eternal City will captivate you, no matter how many times you visit. 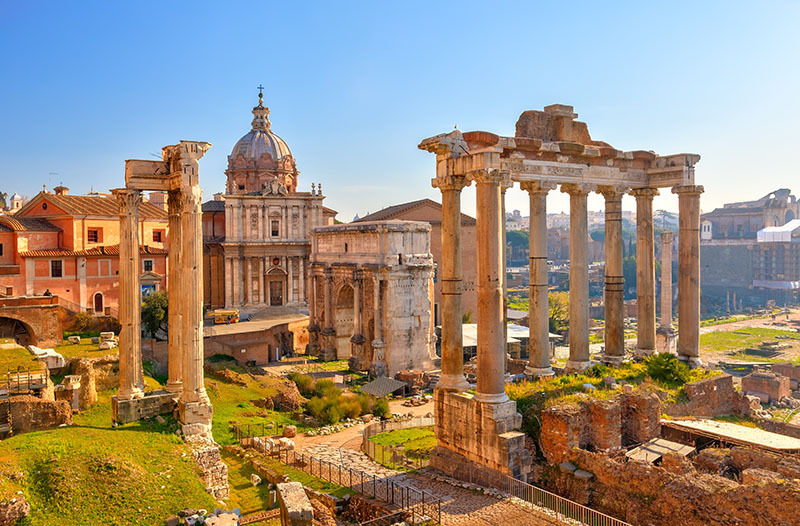 Walk in the steps of gladiators at the Colosseum, channel your inner statesman at the Forum, or gaze up in wonder at Michelangelo's masterwork at St. Peter's Basilica. 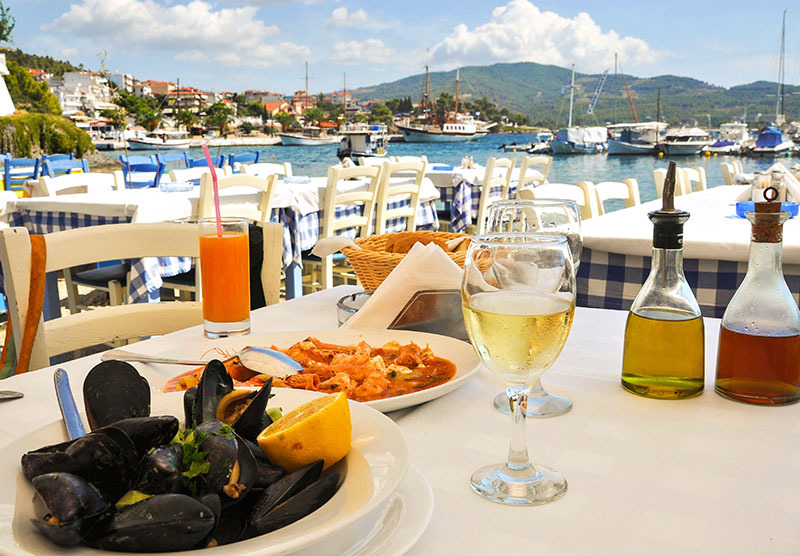 Pasta and vino are a must, and there are plenty of places to relax and refuel after a day of exploration. The decision making continues with a second day in Livorno. 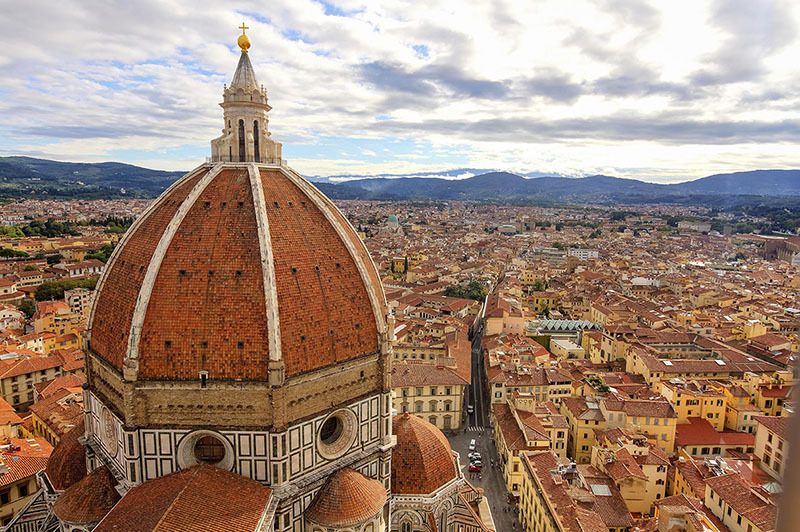 As this is your last day in Italy, we suggest you take in all you can for one final day of adventure. After breakfast depart for the Nice Airport for your departure home. Upon arrival in Chicago, your motorcoach will take you to your original pick up location. 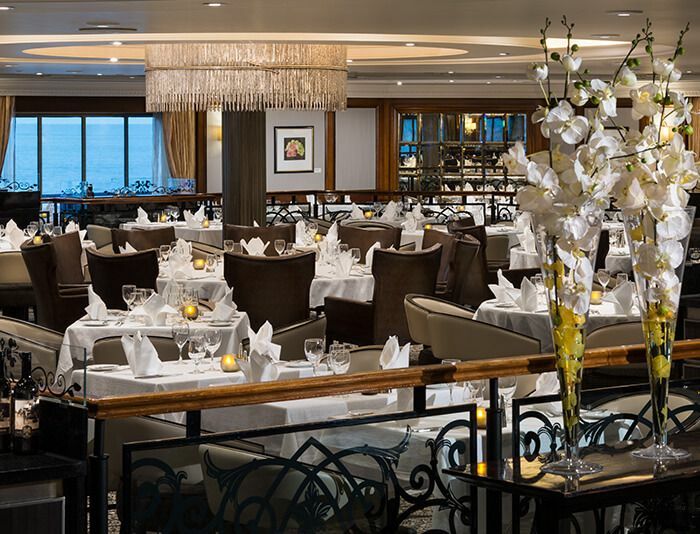 Gratuities for stateroom attendants, and for bar and wait staff, are included. 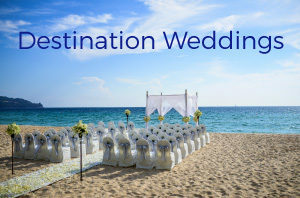 Not Included: Travel Insurance; airline-imposed baggage fees; airport gratuities to baggage handlers, gratuities to motorcoach drivers and tour guides; optional tours; medical services or any other items of a personal nature. A valid passport is required. Single Supplement: Call for more details. *Above base pricing is per person based on double occupancy. 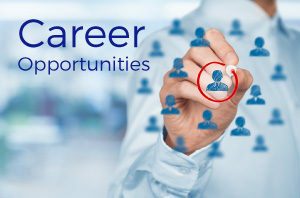 All air taxes and fees of $491.81 per person are included and subject to change. Chives is a casual atmosphere inspired by owner, JR Schoenfeld. 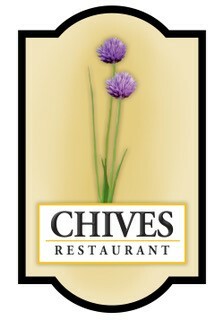 Chives stellar reputation for food quality, presentation, and value are well earned. 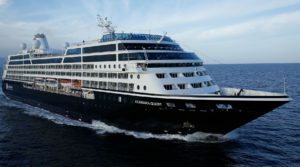 The Azamara Pursuit is smaller than most vessels, which grants access to places that bigger cruise ships cannot navigate. 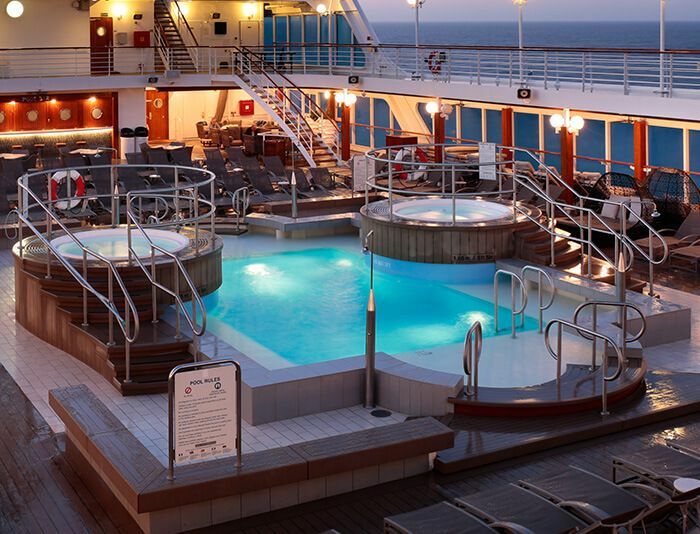 The reduced number of passengers on the ship allows for ample socialization while still maintaining the privacy and luxury that Azamara is known for. When you’re not visiting one of Azamara’s unique ports of call, there’s plenty to do on the ship. Get in some rest and relaxation at the spa, keep up your fitness level at the fitness center, try your luck at the casino or enjoy some live entertainment at the Cabaret Lounge. You can even visit the Drawing Room to relax and read the latest novels. 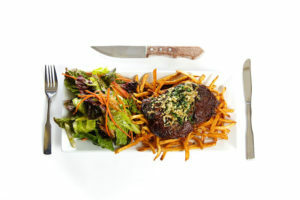 The onboard dining options are varied as well; between the Discoveries main restaurant, the Italian Aqualina, Prime C steakhouse, the casual patio and the Windows Café, every taste can be satisfied. Frankfurt 9:50 a.m. Athens 1:30 p.m.
Nice 1:15 p.m. Munich 2:35 p.m.
Munich 3:45 p.m. Chicago 6:30 p.m.
Tickets will be non-refundable once issued. Changes will be subject to a fee plus any fare difference. Additional restrictions may apply. Flight schedules are subject to change. Fox World Travel has no control over flight or equipment changes, seat assignments, delays or cancellations.